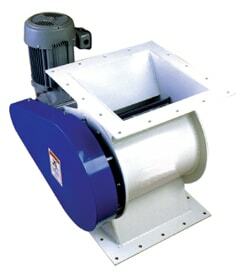 The BAEC FT series airlock is an excellent choice for most dust filter and cyclone applications. The flexible tip design allows the airlock to handle stringy or fibrous products that jam other types of airlocks. Typical materials include paper, wood products, animal feed and other agricultural products. The flex tip material is also excellent in abrasive applications such as glass cullet and other natural minerals.